We previously reported about flesh-eating termites and flying snakes at Red River Gorge. Now, campers are reporting even more bizarre occurrences. The whole area is becoming a hotbed for the paranormal. I spoke to a man who identified himself as "Mike" about what he saw. "It came out of the woods, and made a sound so terrible, I pray I never have to hear it again. I peeked out of my tent, and saw a thing that simply should not be. It had four limbs with hooves, though it stood upright. It had wings like a bat and a head that looked part horse, part camel and part demon! It looked red in color, though it was night, so I may be a little off about the color. It didn't seem to notice me, and I am sure glad about that. A bunch of wild animals were found dead and terribly mutilated the next day." 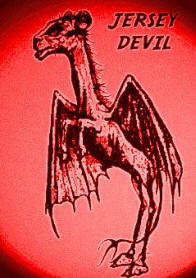 What "Mike" has described has a name: The Jersey Devil. What was it doing in Kentucky though? Its like have never been seen anywhere near this far south. He is not the only one who has seen the thing, but his is the most vivid description of it. I also spoke to another camper who would not tell me his full name, but asked me to call him "Mitch". He describes creatures with a nearly human appearance except that it has only one large eye above its nose where there ought to be two: Cyclops people. He tells me that he thinks they live underground. "I saw him right there. 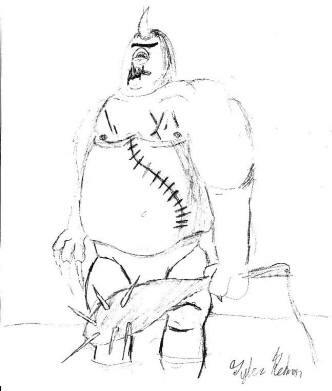 First, it looked like an ordinary man, only really tall, but then I noticed that it was a Cyclops just like in mythology. It spotted me. I am sure of that, then it grunted and disappeared into thin air! I went to investigate in the morning, thinking maybe it was just a trick of the light, and I was seeing things, but there was a single pair of footprints right where it had been standing; a single pair! There were no more behind it or in front". He then told me that he stood stood in the footprints to compare them to his own, and estimates that shoes to fit them would have to be at least size 16. "I do not know if it is dangerous, or was just as scared of me as I was of it, but I think I will have to find a new place to camp now. I don't want to cross paths with it again. You will not get me to go back to Red River Gorge!"